Based on the design by William Morris and Edward Burne-Jones, this tapestry depicts Pomona, the goddess of fruits and harvests. She’s shown standing barefoot in a flowing pink robe. There’s an elaborate weaving of leaves on her dress on the bodice and sleeves. She holds apples in her gathered skirt, and reaches for more with her other hand. The foreground and background are acanthus leaves and sunflowers, reminiscent of the “Mille-Fleur” style background of “thousand flowers”. “Pomona” celebrates the change of seasons in a wonderfully decorative way. 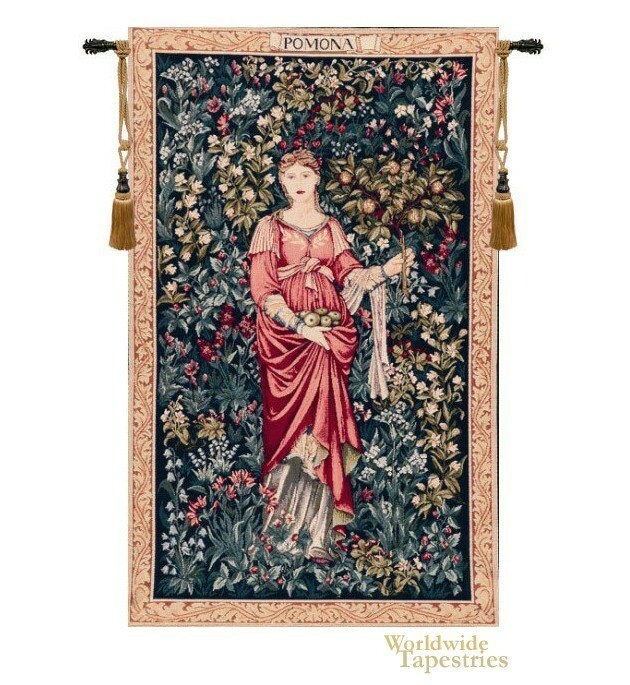 Pomona tapestry is lined and has a tunnel for easy hanging. Note: tapestry rod and tassels, where pictured, are purchased separately. Dimensions: W 19" x H 32"